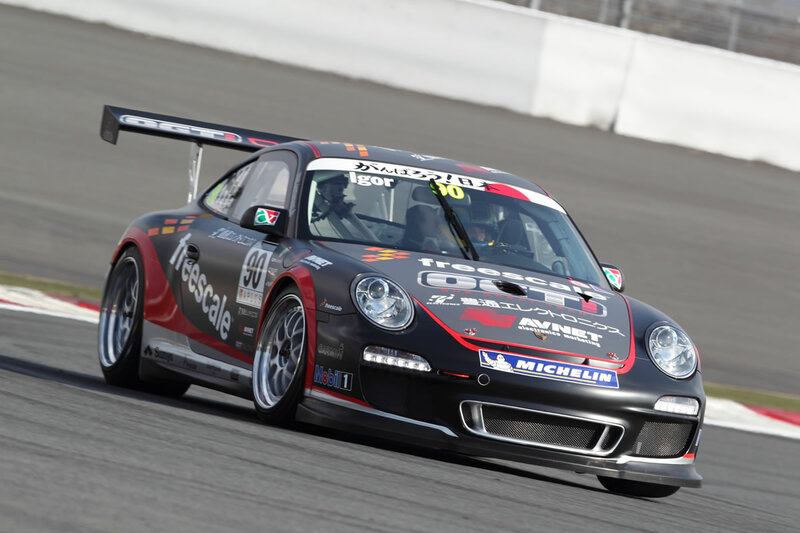 We kicked off the year with the Car Electronics show in January with our race-winning 2012 Porsche 911 GT3 Cup car. 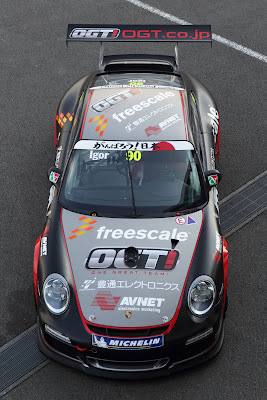 After a hugely successful 2012 which yielded Freescale Japan an incredible ROI in direct new business of selling cold, hard, real microchips and sensors, we elevated the program to SUPER GT GT300 for 2013. Here's a quick overview of the OGT! Racing program. 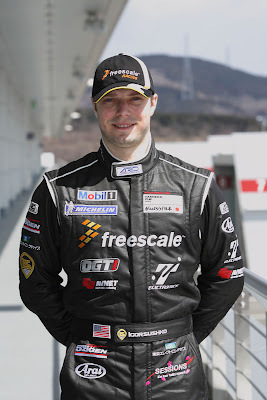 Our sponsor-base increased - Freescale, Marubun, Avnet EM, Toyotsu Electronics, and Tokyo Electron Device and we alternated the main sponsor branded between all of our sponsors on a per-race basis based on race location and sponsor customer bases geographically. 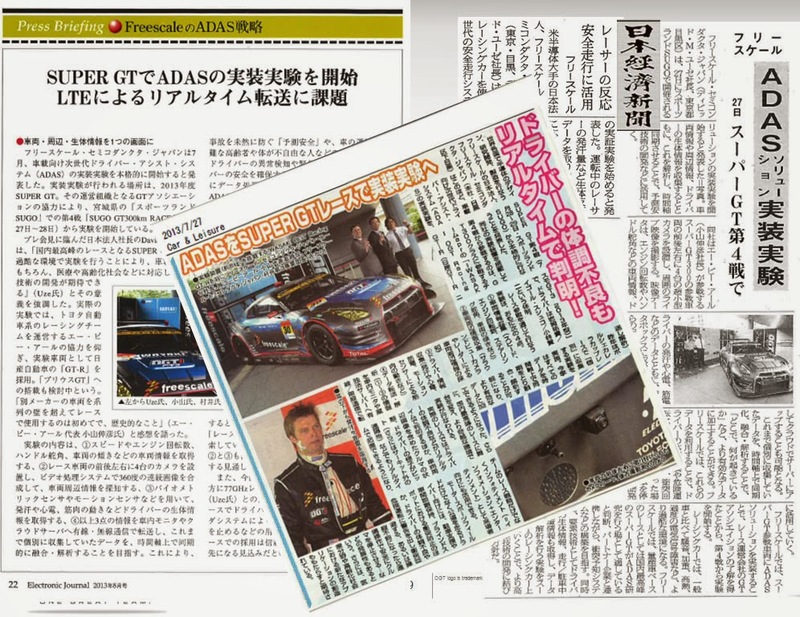 Partnering with apr Racing Team, we became the first team in Japanese GT history to field both a Nissan and a Toyota, as our sister car became the Toyota Prius Hybrid - an interesting racecar with a body of a Prius powered by what is essentially an IndyCar engine in the middle of the chassis. 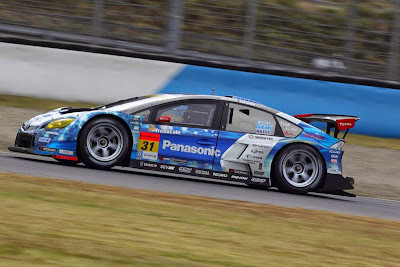 The SUPER GT GT300 Toyota Prius GT Hybrid and Nissan GT-R GT3 NISMO from the top. We expanded on all fronts, including a series sponsorship of the SUPER GT racing series itself. Our hospitality, which could hold up to 80 people per day in 2012, was expanded to accommodate over 120 people per day. As a result, we hosted nearly 1,100 people and over 700 Freescale customers over the year. 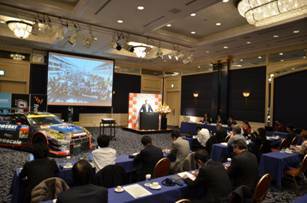 Executives from companies like Toyota, Nissan, Honda, Keihin, Denso, Mitsubishi Electric, Toshiba, Hitachi, NEC, Alps, Panasonic were a common sight. The video is in Japanese but is relatively self-explanatory. The end-result near the end of the video is pretty interesting. The active safety R&D program that we initiated in 2012 became the benchmark for direction for our competition, as became clear in the trade shows in subsequent years. In 2012 Car Electronics Show in Tokyo, Freescale Japan was the only company in the space promoting its active safety-focused R&D program in our race car. In 2013, I noticed a few other competitors showing similar technologies on small RC cars and such. In the 2014 show, nearly every single microchip company on the floor had taken the theme we developed! The media coverage also grew with the R&D program getting picked up in over 20 newspaper articles and hundreds of locations online. 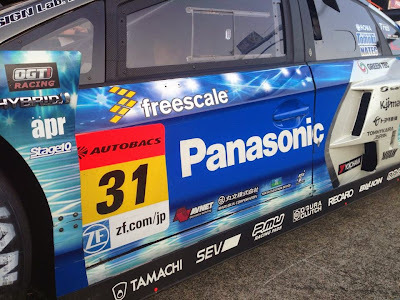 The mega Designing with Freescale event we hosted during the Asian Le Mans series race at Fuji Speedway was fantastic - pairing motorsports, R&D, and freescale seminars for our customer engineers, with tons of activities for the entire family to enjoy. 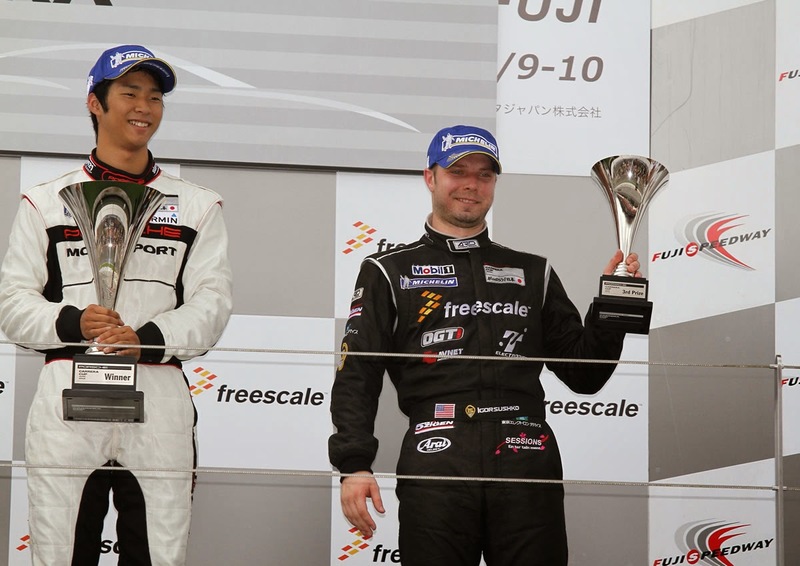 2012 was the first year of the Freescale Racing program in Japan. 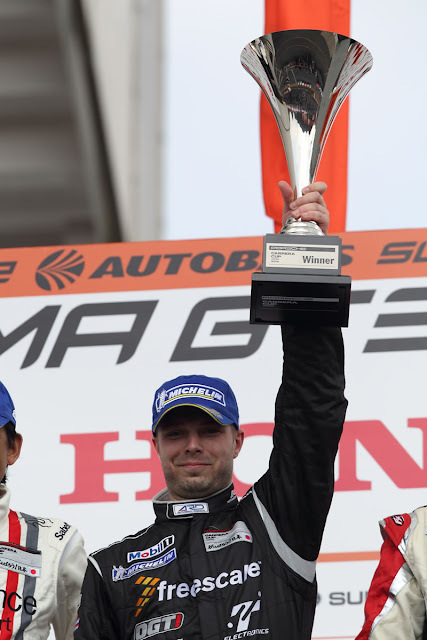 It got off to a rocket start with a win in our inaugural race in Okayama. 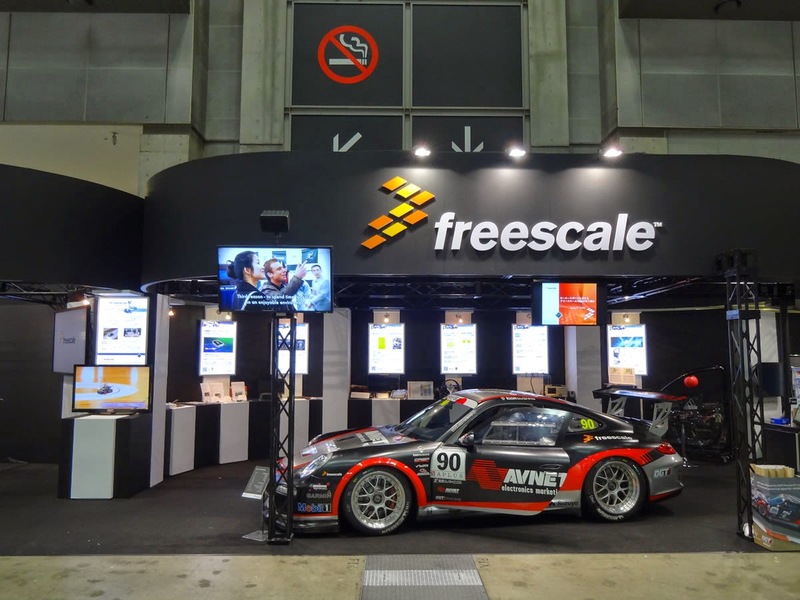 Through the 2012 season, we hosted over 500 people in our exclusive VIP Hospitality, hosted the first-ever Freescale One Make Festival at Fuji Speedway that combined the traditional embedded processing trade show format with racing, and racked up a total of 5 podiums. As program manager for the entire project, it was sometimes a challenge to keep everything at its optimum. My role included the creation of R&D program direction, hospitality structure and oversight, PR/marketing, and of course all things that need ironing out for the actual racing. Securing hundreds of thousands of dollars in sponsorship from the beneficiaries of the program was a task that necessitated me to build trust and confidence in me by our partners – Freescale, Toyotsu Electronics, Avnet Electronics Marketing, and Tokyo Electron Device. Navigating the maze that is a multi-billion dollar corporation and its politics was also something new. 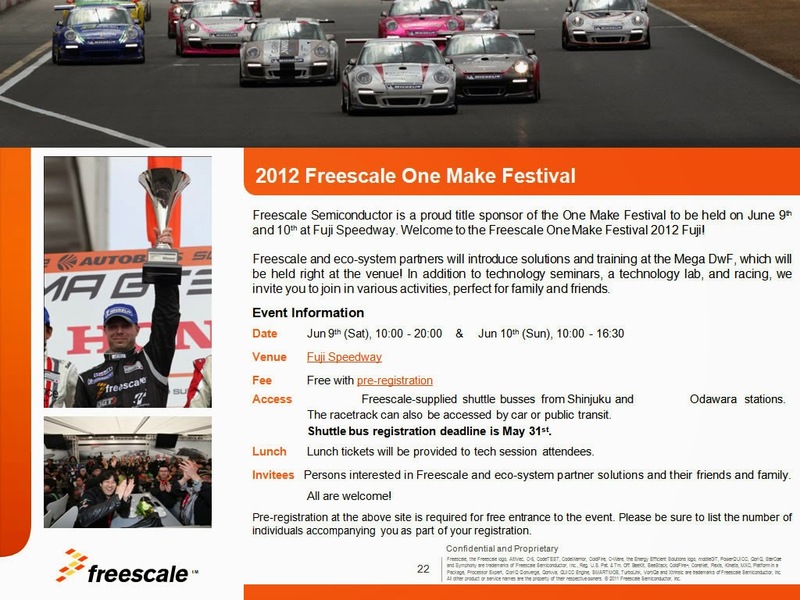 Check out this video covering the Freescale One Make Festival. 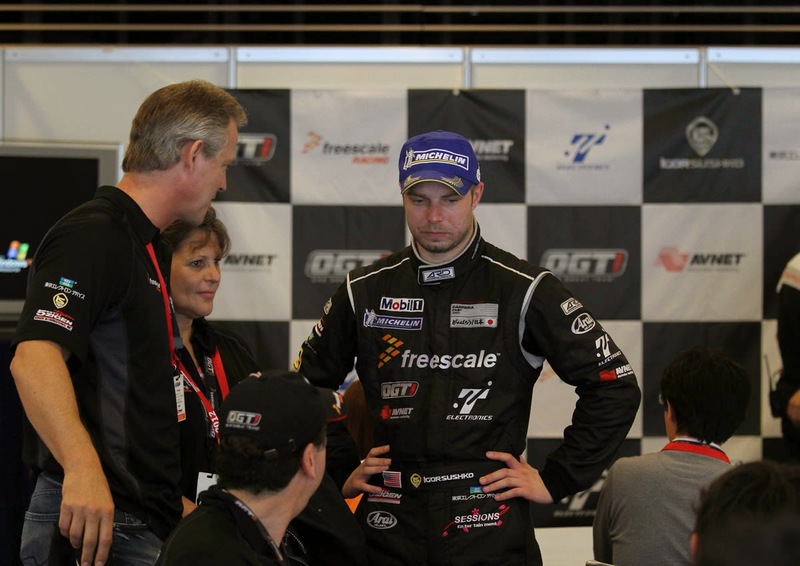 Evaluation of the racing program effect on new business that is won by Freescale or its distributors : Distributor sales and Freescale sales evaluate each deal on a scale of 0-10 with granular explanation of each number, which then equates to the percentage of the deal the racing program gets credit for a given deal. If Mitsubishi Electric were to have 25 of its employees from management, procurement, and engineering present at a few races back to back in our VIP hospitality, and new RFPs/RFQs were provided in a timely fashion at or after the events to Freescale, then the sales guys from both Freescale Japan and the assigned Freescale Japan distributor responsible for this customer provide their detailed feedback and evaluation of the effect the racing program. The effect of the program was vast. 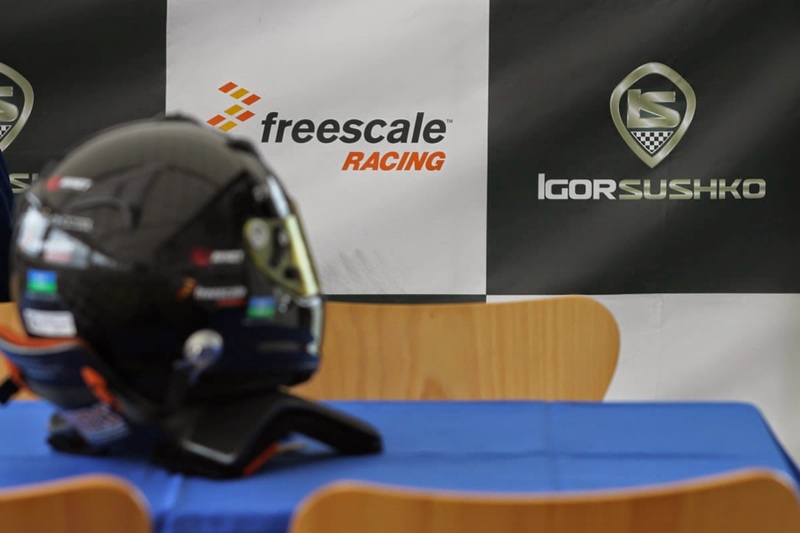 There were many components to it: our R&D, our hospitality, the sheer excitement and camaraderie that racing creates, and the overall Freescale brand trust and elevation via PR and marketing. 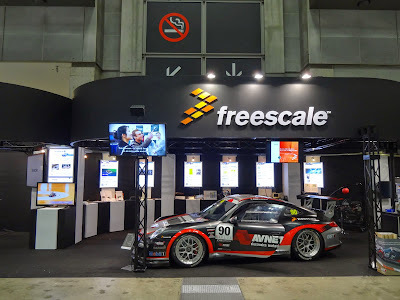 The main changes at Freescale Japan between 2010 and 2012 is the Freescale Racing program and a revamp of the Freescale Technology Forum (FTF) event. 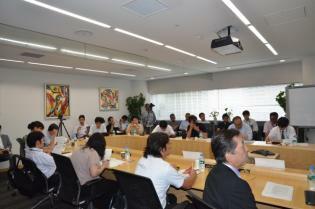 Note that I was also the Program Manager for the 2011 Freescale Technology Forum (FTF) Japan. We grew the event 4 times in space, 4 times in number of customers, and spent less money than the previous year as a result of hundreds of thousands in sponsorship revenue I secured from Freescale's eco-system partners. A little bit of business background. Freescale Semiconductor, based in Austin, TX, is a $5B public corporation, and holds a huge market share in automotive chips and sensors worldwide. It’s main competitor, especially in Japan, is Renesas. The issue regionally is that Renesas has tens of thousands of employees in its home-base – Japan, and its sales force is thousands strong. Freescale Japan’s easiest route to growth is to siphon away Renesas’ market share, since Renesas’ sales in the space of competition with Freescale may be 20x of Freescale Japan’s total revenue. 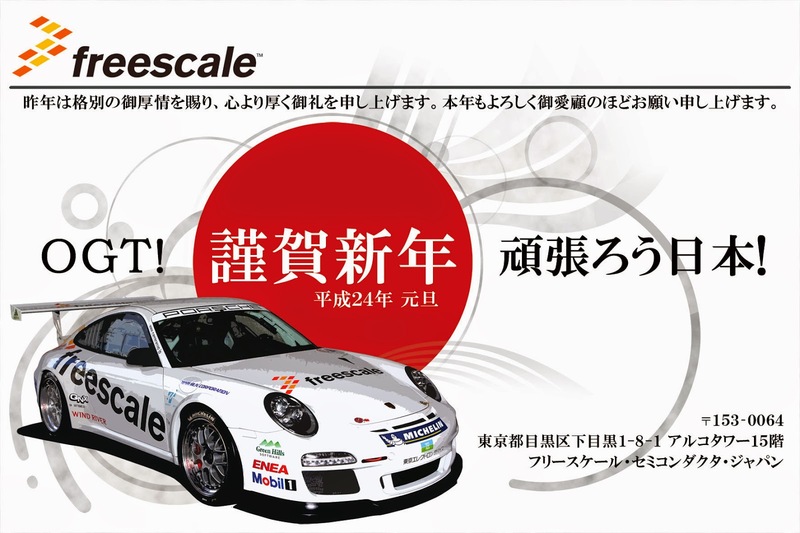 Meanwhile, Freescale Japan’s sales force, even if you add in all of the distributors sales force on the Freescale account, is a couple of hundred. 1. 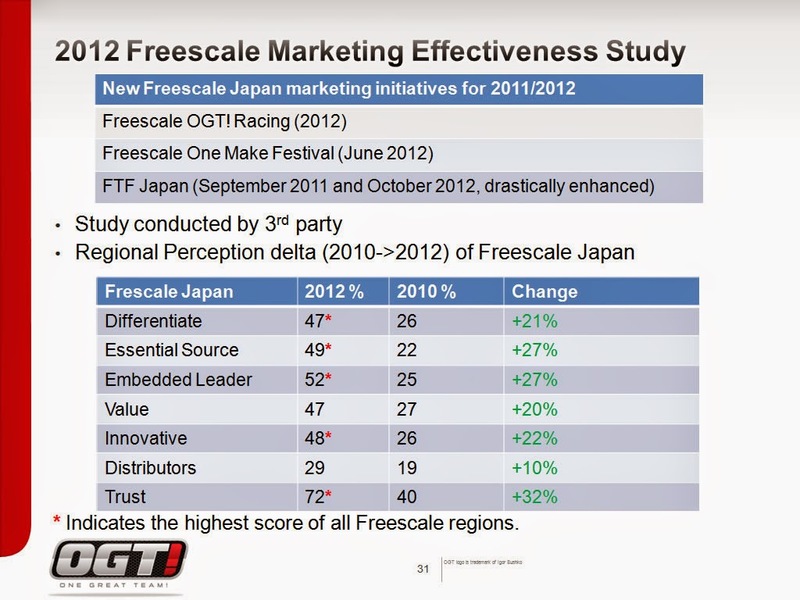 Unique positioning of Freescale Japan as the innovator in the Japan market. The only microchip company with a race team conducting active-safety R&D and thus showcasing the engineering know-how and its portfolio of products – spanning the networking, automotive, industrial, and consumer segments. 2. Psychology: Racing is competition to the extreme. By hosting hundreds of decision-makers from our customers, we create our own team that INCLUDES the customers. This team is full of passion and excitement, with everyone rooting for the same thing. 3. Facilitation of direct and friendly relationship with customer management base. Instead of trying to sell from the bottom at the customers, we sell directly to the decision-makers and management, who are now not only on our side logically, but also emotionally. 4. Significant POSITIVE media exposure: Prior to this program, Freescale would have a handful of journalists show up for a press conference. We hosted multiple press conferences centering on the Freescale Racing program and the room was packed every time. Consider what journalist whose job it is to cover the embedded microchip marketplace who would not want to go to a press event about RACING! 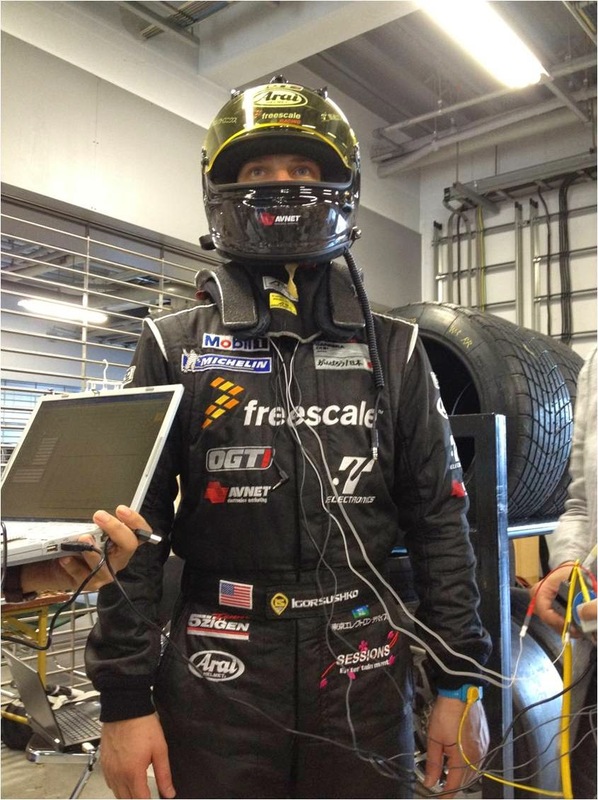 On top of that, the race car is packed with Freescale technology, and we are doing something no other competitor is doing! 5. The camaraderie that was created between Freescale and its distributors was immense. Spending weekend after weekend together, in a positive and energetic environment. That is such huge motivation for people whose jobs are usually to be at the desk or visiting customers for endless meetings that would want to make you tear your hair out. What did all of this mean to the success of the program? Freescale received roughly $55 million dollars of product commitments which will flip to revenue over the subsequent 5 years or so as a DIRECT measured result in 2012. The expanded value of new business that the program "affected" was in the hundreds of millions of dollars. The sales cycle, especially in the automotive segment, is rather long, and can take up to 5 years from winning the design to going to production. 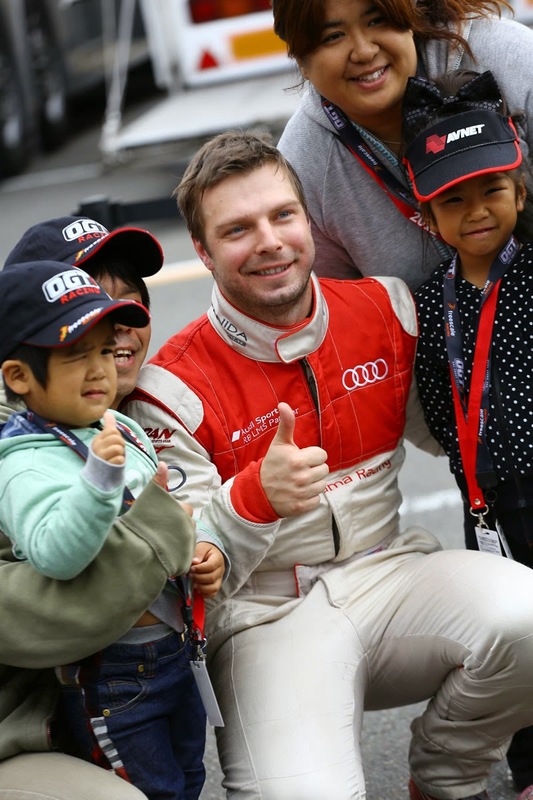 At the season finale at Motegi, I was asked by Hitotsuyama Racing to also race in the Audi R8 GT3 during the same weekend in SUPER GT GT300, resulting in a lot of jumping back and forth between the Porsche and the Audi. 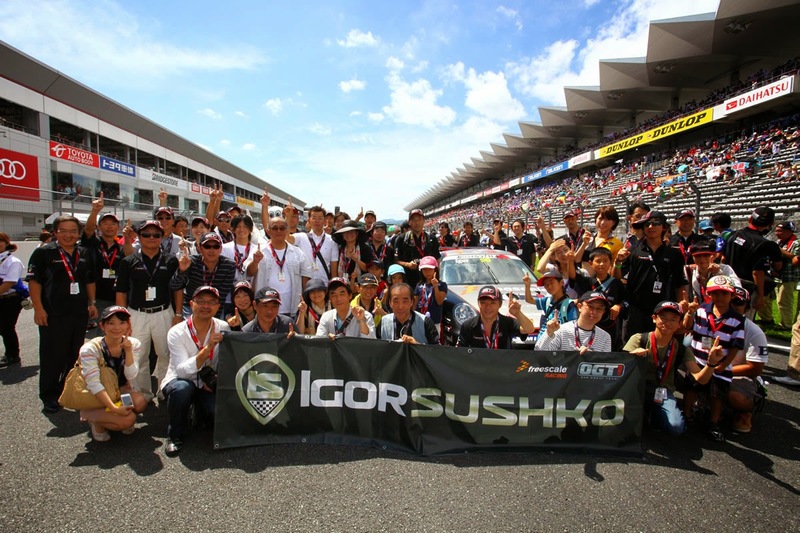 In the following Fuji Sprint Race for SUPER GT, I secured the first and only points position in that car for the team for the season. Stay tuned for the update covering the 2nd year (2013) of the Freescale Racing program in Japan! 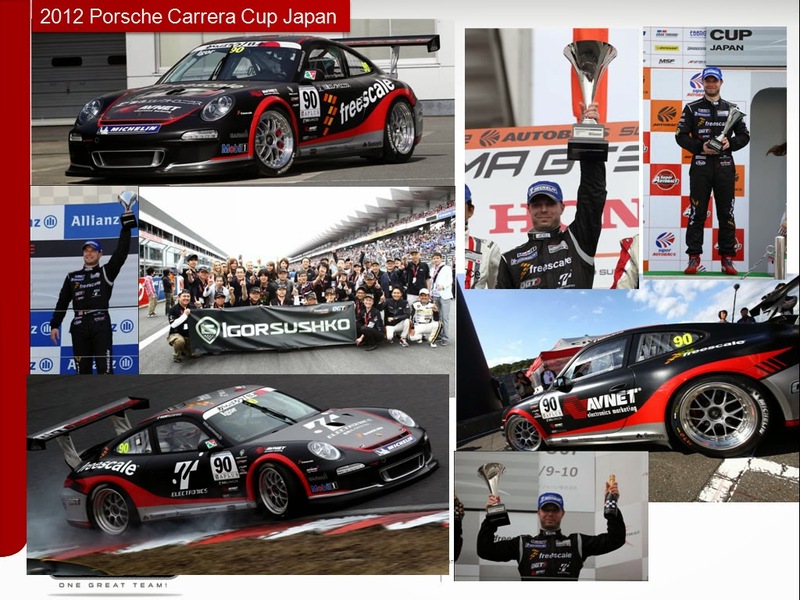 As I reflect on the last few races in the 2012 Porsche Carrera Cup Japan with the #90 OGT! Racing Porsche 911, I cannot help but think that you can't make this stuff up if you tried as a work of fiction! 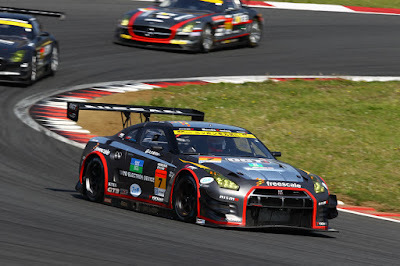 Round 3 of the series took place alongside SUPER GT in May at Fuji Speedway. We arrived to the track after a win in the season opener followed by a strong 3rd place finish in round 2. 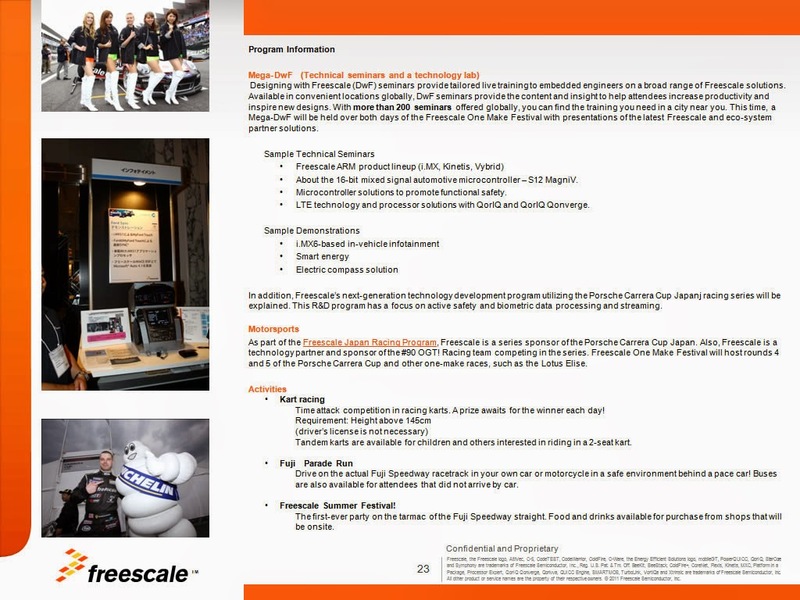 Great momentum and excitement throughout our organization and good progress on the R&D side of this project with Freescale made it an excellent start to this long-planned-for program. Practice sessions on test day prior to the qualifying day were decent, but again in the rain. After a tactical mistake in opting not to use 2 sets of new tires in qualifying as the track conditions improved considerably near the end of the session, as most other teams had done, prevented us from improving on our time set early in the session. This resulted in qualifying in 4th position for the race. This was the first event for which we mounted Freescale's next-generation 360-degree surround view digital camera system. It consists of 4 cameras, each capturing over 90 degrees around the car in each direction. The system runs on Freescale's i.MX6 chip and Denso cameras. The ruggedness of the system, which we first tested several days prior to the race weekend, was fantastic. It is completely immune to the severe vibrations which are natural to the motorsports environment. Another potential issue was the interference of many other electronics onboard the car, which can always present issues that are oftentimes best described as "gremlins," and make the best engineers scratch their heads in defeat. None of that with this system. Even in pouring rain, the system proved impeccable. Unlike the poor weather on the previous day, race day welcomed us with beautiful sunshine. Just as in Okayama, we had over 50 Freescale eco-system attendees on each day coming to support our team and to learn about the R&D program. To cut to the chase on the racing front - we had a good start from 4th place and quickly passed the 3rd place car going into turn "B" chicane. But then, my error caused the below incident, which fortunately did not damage the car. It took time to get back to the track and we had to pit for a new set of tires, effectively ending our contention for any kind of position. Usually, this kind of accident is caused by some amount of steering input to unbalance the car, which in a Porsche is immediately punished by the rear floating up and to the side, since the heavy engine is in the back. In this case though, you can see that steering was not the issue, but rather a loss of sight of the correct braking point by me, which resulted in a natural instinct to apply stronger pressure to the brake pedal, and not visible in the video, but the telemetry data showed that rear tires were on the very edge of adhesion as they rotated at around 150km/h and decreasing while the car was traveling at a much greater speed. Being able to maintain this on the edge would in fact result in maximum braking, but as I downshifted the rear immediately stepped out. This was possibly caused by some centrifugal forces within the drivetrain. Essentially, in theory, the car was so much on the edge with all the traction being used to stop the car, just a small application of force, like a finger poking at the side of the car, would have probably unsettled the car enough to take it into the spin. PCCJ's aggressive points structure - 20 points for 1st, 18 points for 2nd, 16 points for 3rd, made this an extremely costly mistake for our team and wiped out my lead over the next place car in championship contention, which was something like 14 points going into round 3. Freescale became the title sponsor of the annual One Make Festival held at Fuji Speedway. 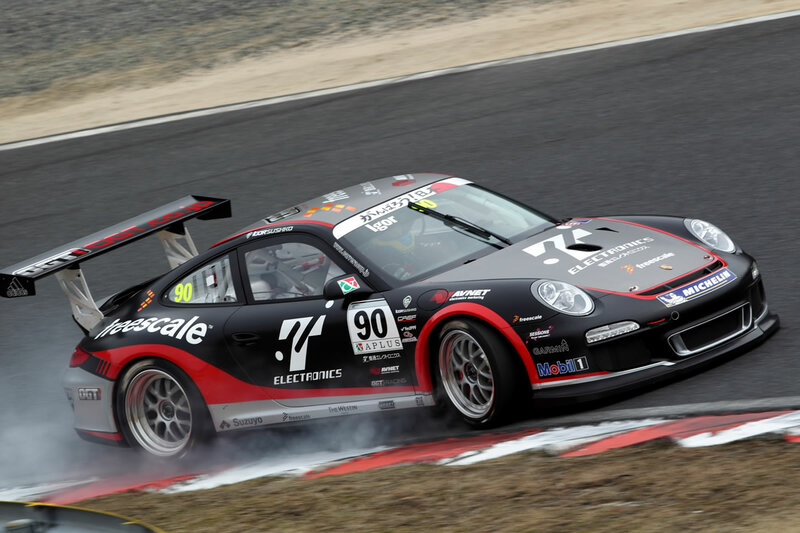 This is an event with a variety of one-make series racing over the weekend, including the Porsche Carrera Cup. Some others series included small formula cars, Lotuse Elises, and Honda Civics. 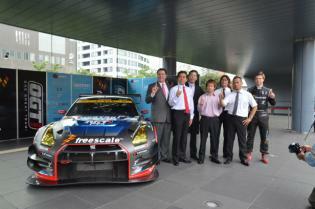 The event was combined with Freescale's Designing with Freescale event (DwF). These are seminars held all across the world - over 200 annually. Usually, the attendance is from the dozens to about a hundred eco-system engineers learning about the Freescale and eco-system hardware/software tools to help them enable integrate the Freescale solutions in their products. Despite rain on Saturday, thanks to Freescale Japan's awesome organization, 340 eco-system engineers attended the seminars and had 170 family and friends join in the fun of watching racing. 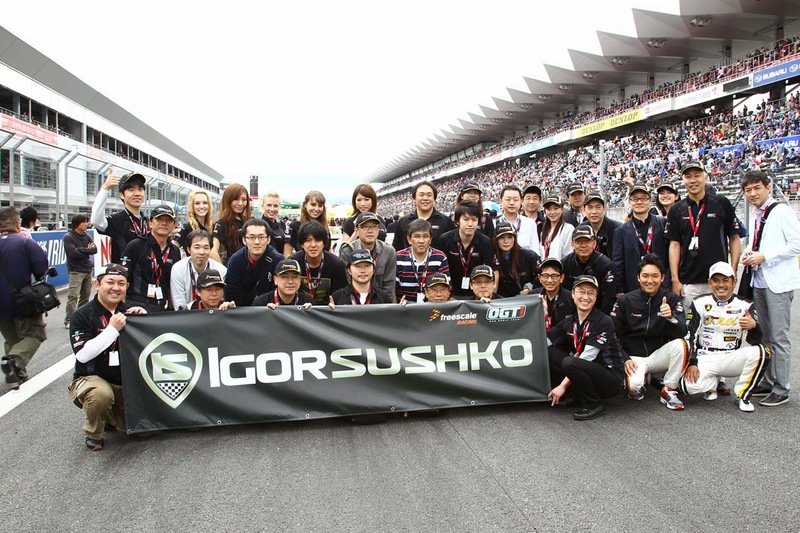 On Sunday, over 200 engineers attended with around 200 family members and in addition to in-depth technology seminars, took part in go-kart racing and even a parade run around Fuji Speedway. I imagine this was most people's first ever experience driving on an actual race track - and everyone seemed to have a blast! The race was relatively straight-forward. After the previous day's disappointment of picking the wrong tires, we started in 9th position on the grid as a result of a relatively decent time that we set during the Rd.4 race near the end on dry tires. As the lights went out, we slowly but surely continued to pass cars to end up in a podium position for the Championship class. OGT! 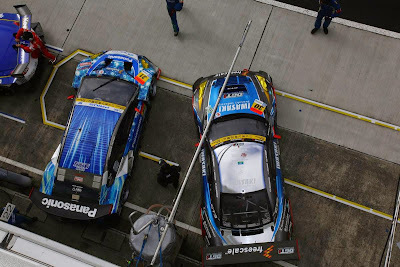 Racing – Technology Innovation is Why We Race! The 2012 OGT! 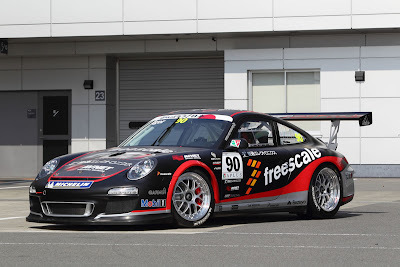 Racing program in the Porsche Carrera Cup Japan series brings together Freescale innovation with the R&D and marketing platforms offered by professional motorsport. We are working with various technology partners. Tokyo University is looking to improve medical research with Freescale’s biometric technology. On the marketing side we have already succeeded in picking up positive media exposure following our win in the opening race of the season. The program is still in its infancy and we’d appreciate your feedback, ideas, and leads. Racing has always been at the forefront of intense competition and technology innovation. The most efficient overall program that takes full advantage of the rules, wins. Motorsport serves as a technology development platform for the core aspects of consumer vehicles. The first electronic active suspension systems were developed in motorsport. Porsche is one of the first to transition this technology to production sports cars with the current iteration of the 991-generation Porsche 911. The system is called Porsche Dynamic Chassis Control (PDCC). 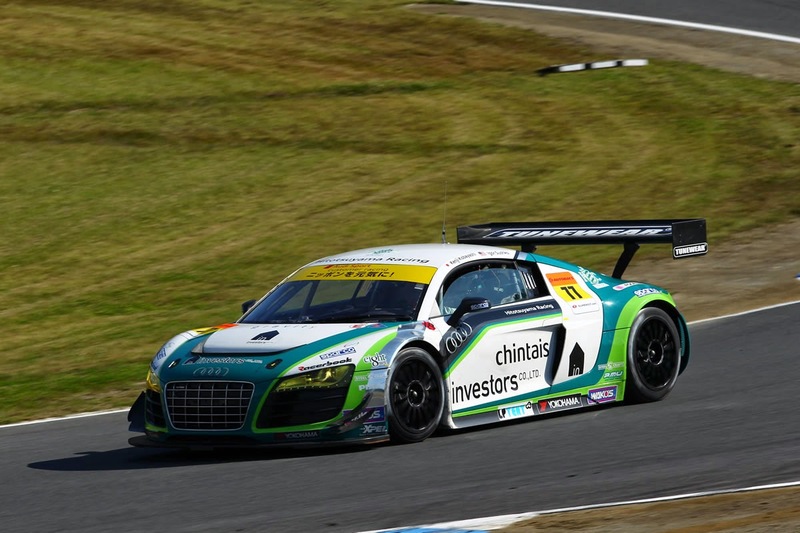 On the green technology side, 24-hour endurance races require maximum fuel efficiency balanced with power-output. Therefore, manufacturers around the world develop new fuel efficient engine technologies for motorsport to empower production cars afterward. Formula One is constantly on the cutting edge of new technology and the current Kinetic Energy Recovery System (KERS) is by far the most efficient hybrid technology in the world. The McLaren team has built their KERS system on Freescale silicon. 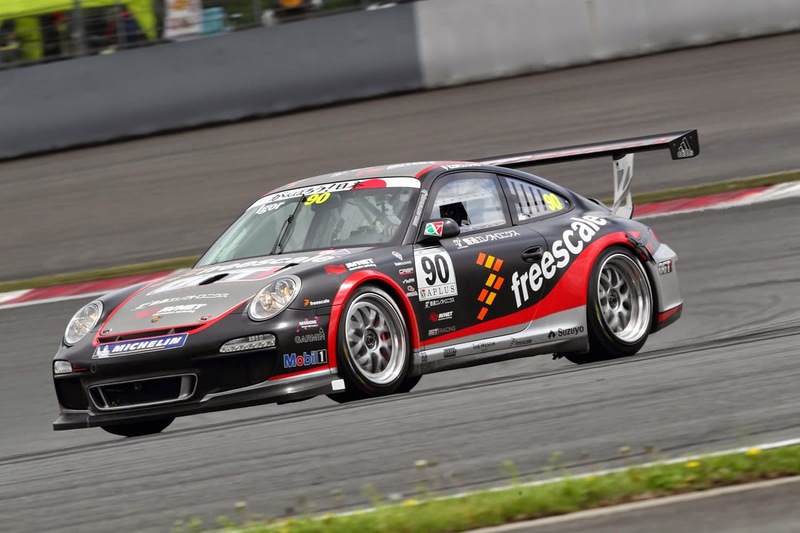 Race cars must also be built to be as durable and light as possible, which is why the motorsport industry was the first to adopt carbon-fiber materials in the 80’s. The aerospace industry is now the largest buyer of carbon fiber because the material proved its effectiveness in motorsports. There are so many aspects of this OGT! 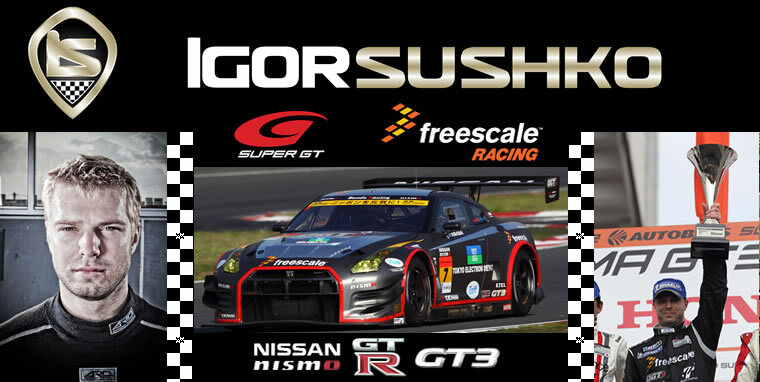 Racing program that get us excited, and we would like to share each one with you. As this is a new technology R&D project, we must keep the details confidential for the time-being, but here is the basic outline of what we plan to introduce. There are four main components in this project that span all four of the Freescale business segments. Driver biometrics: we will be placing an array of Freescale sensors on the driver’s body. Vehicle telemetry: including steering angle, brake pressure, lateral and longitudinal G-forces, speed, RPM, throttle application, and all of the engine’s vitals. The data-logging unit is powered by Freescale chip. Onboard video and other video technologies. All of the above data will then be live-streamed to a world-wide consumer audience using 3G/LTE technology with an intuitive user interface. What is absolutely fantastic is that every piece is powered by Freescale – biometric sensors (industrial segment), vehicle telemetry data aggregation and video (automotive segment), streaming of all of the data via Freescale-powered LTE basestations (networking segment), plus we hope to make an even more advanced GUI accessible via Freescale-powered smart connected devices (consumer segment). The convergence of all of the segments within one project is revolutionary and demonstrates the unrivaled scope of Freescale solutions. 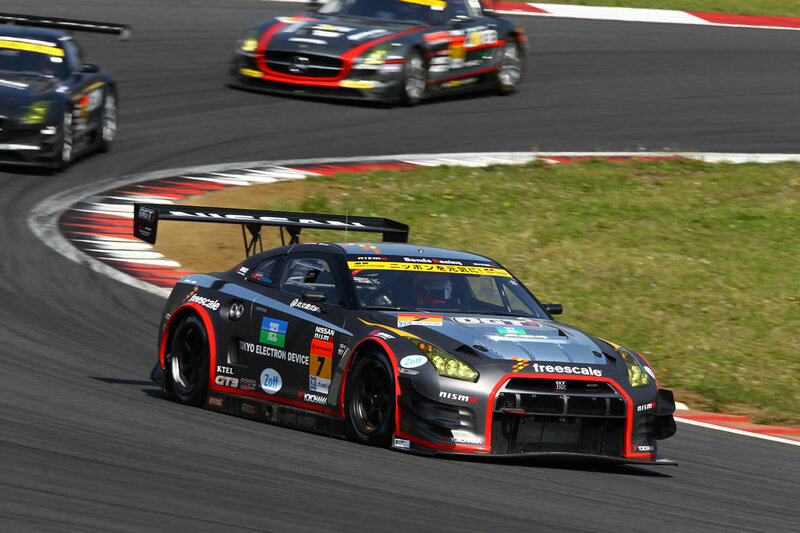 Our race team of mechanics and engineers is KTR – located next to Fuji Speedway. 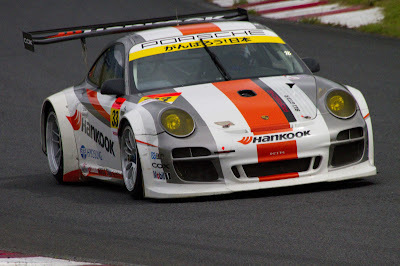 KTR is by far the most advanced and experienced Porsche race team in Japan, and we have a sister team operated by the same group of people in the SUPER GT series – the factory Hankook tire team, #33 Porsche 911. 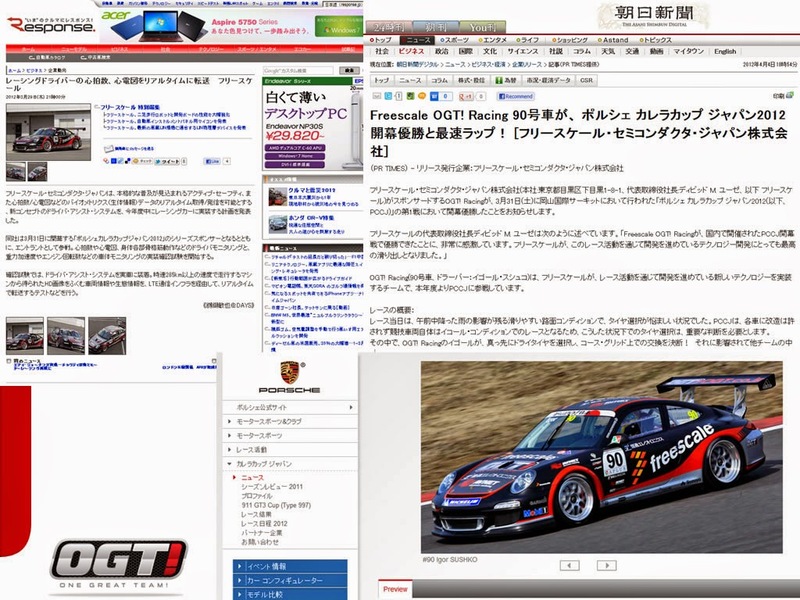 We were paired with KTR as a result of Porsche Japan’s direct instructions to ensure maximum opportunity for success on the track. The competition vying for series championship is intense, especially with a winning former SUPER GT GT500 Toyota factory driver and well-known Porsche racing ‘expert,’ and a young driver that has come up through the same open-wheel driver development program as myself , funded by Honda, Nissan, and Toyota (Formula Challenge Japan). 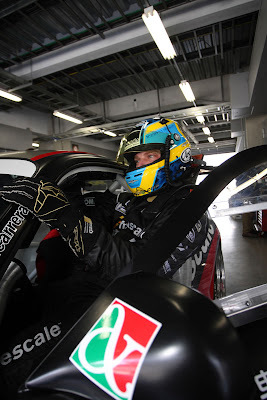 We had a two-day test at Fuji Speedway mid-March. Despite having been out of the racecar car for over 18 months, thanks to great teamwork we topped the charts as the fastest car. 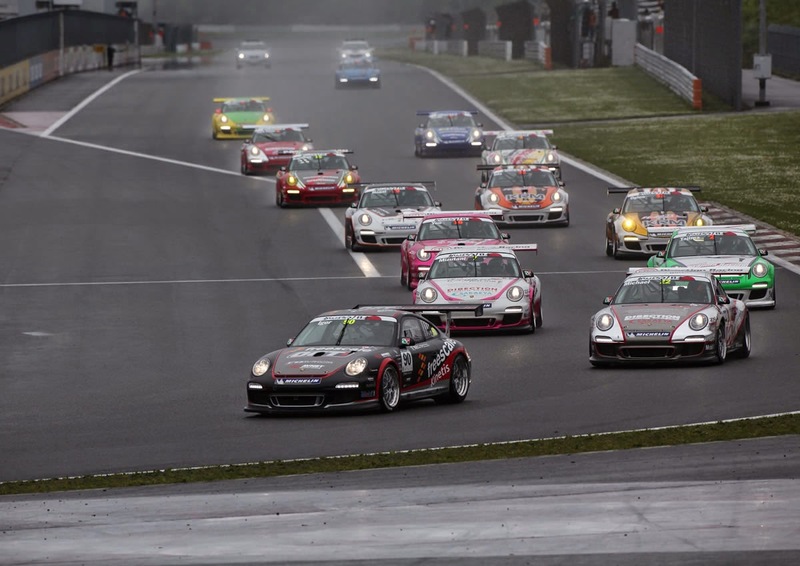 The race weekend began with challenging weather as rain poured for Saturday morning qualifying. We were able to qualify in 2nd place for the afternoon race. The unpredictable weather continued and it even hailed at one point! As all the cars moved to the grid, with heavy clouds hanging over us but strong winds drying the track rapidly, our team was the first to make a decision to start the race on dry tires. This was a severely risky maneuver as the race is only 15 laps (~25 minutes). We were essentially doomed had rain resumed because slick tires have zero ability to disperse water and must reach very high temperature to generate any kind of grip. Driving on dry tires on a wet track is like walking on ice in leather-soled shoes, at 160mph. Several other teams followed our lead, and the race got under way. Luck was on our side as strong winds continued to rapidly dry the track, and as the race played out, it was clear that anyone not on dry tires was out of competition for the win, so long as rain did not come back. Tire management is a critical component in racing, as tire temperatures and tire pressures can easily rise beyond optimum operation, resulting in a severe decrease in grip. Cars on wet tires had the upper hand at the start of the race, but that situation quickly reversed, as I passed two cars in front, with only the GT500 veteran left to pass, also on dry tires, for the win. Once the Michelin tires were ‘on,’ we quickly closed the gap and patiently waited for an opportunity. It came a few laps later when we were lapping traffic that had stayed with wet tires, resulting in an easy and safe pass. After that, we continued to expand our lead, and our first goal of securing a win for this racing program in its debut race became a reality. This program is the perfect storm – an exciting technology innovation platform that will be experienced by thousands via our live-streaming technology. OGT! Racing’s message will reach far beyond just the interviews and articles in the media. Pair this with a winning program and our momentum is compelling. 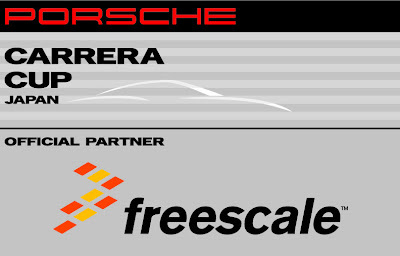 The opportunity to co-brand with global leaders and Freescale partners, like Porsche and Michelin helps us differentiate Freescale from the competition in a meaningful way – this is a branding exercise supported by our solid backbone of new technology activation that can benefit end-users. 2012 - Most Exciting Yet! 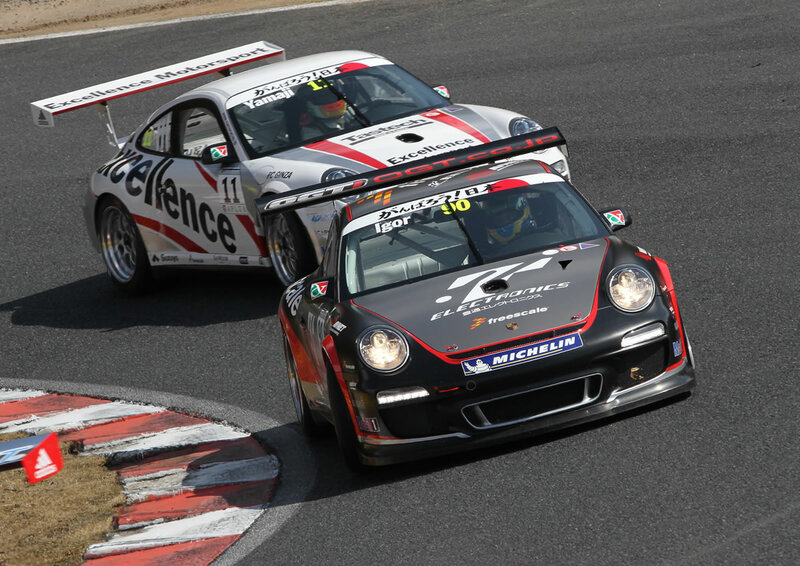 I am happy to announce that I will be racing in the Porsche Carrera Cup Japan series this year. Team: OGT! Racing. 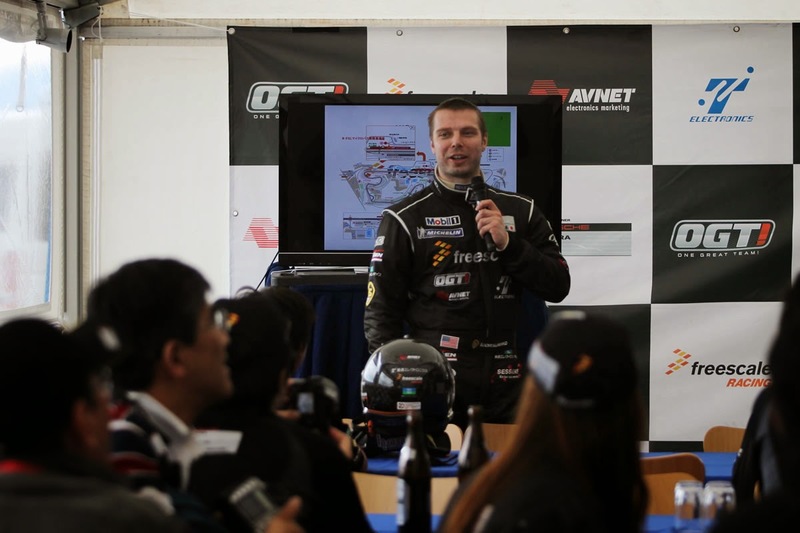 Sponsors include: Freescale Semiconductor, Avnet, Toyotsu Electronics, and Tokyo Electron Device. This is a collaborative R&D project covering semiconductor applications in automotive, medical, networking, and consumer segments. Stay tuned for some brand new things you've likely never seen before! Furthermore, we plan on working with academic/medical institutions to advance research in biometrics. Freescale Semiconductor, Inc. produces and designs embedded hardware, with 17 billion semiconductor chips in use around the world. The company focuses on the automotive, consumer, industrial and networking markets with its product portfolio including microprocessors, microcontrollers, digital signal processors, digital signal controllers, sensors, RF power ICs and power management ICs. The company also holds an extensive patent portfolio, including approximately 6,100 patent families. In addition, the company offers software and development tools to enable complete solutions and to support product development. The company is headquartered in Austin, Texas with design, research and development, manufacturing and sales operations in more than 20 countries. To put all of this in layman's terms - Freescale manufacturers an enormous portfolio of microchips that have applications in virtually anything that has electricity - TVs, remotes, ECUs, G-sensors, powertrain, network basestations, e-readers, cameras, medical sensors, and the list goes on. Freescale is the spin-off entity of the original Motorola Semiconductors division, created in 2004. It has a long history of being in the forefront of innovation. 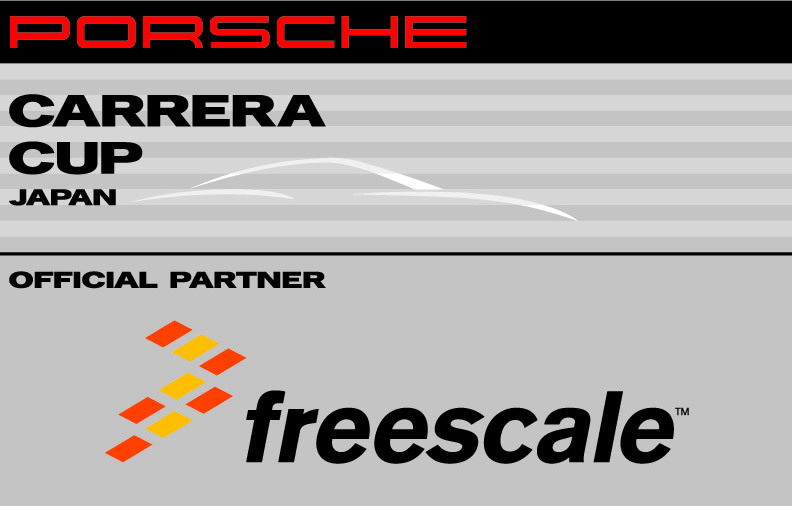 As part of the 2012 program, Freescale Semiconductor Japan is a series sponsor of Porsche Carrera Cup Japan - allowing for close collaboration, as Porsche is also of course a Freescale customer. Another fantastic opportunity is the fact that Michelin is the spec-tire used in the series. Freescale works with Michelin on joint R&D in areas like active suspension and other innovations. As I have been preparing this 2012 program for the last 1.5 years, I actually had not had a chance to be back on track in a racecar since the summer of 2010 (SUPER GT GT300 - Taisan Porsche). Our race team garage for 2012 is KTR - the factory Hankook Tire team in SUPER GT racing in a Porsche 911 GT3R. 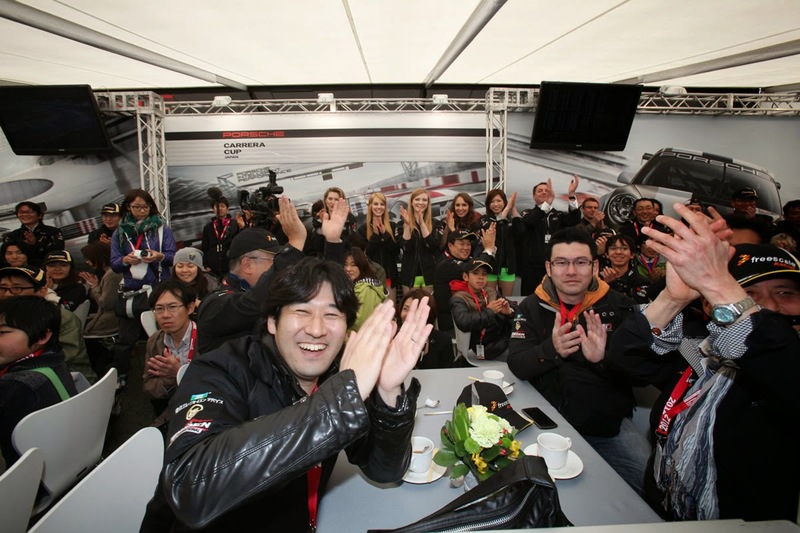 This is hands down the best Porsche team in Japan and I am excited to be working with them this year. Our team has one of six 2012 997 GT3 Cup cars allotted to Japan - and what a fantastic car it is! 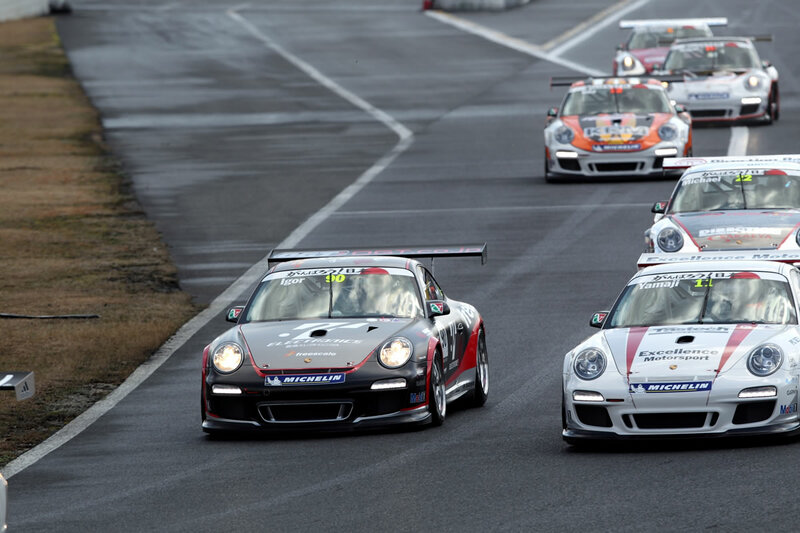 Compared to the SUPER GT GT300 Taisan Porsche - the Cup cars actually have a higher top speed due to more power output and significantly less downforce. So in comparison the car naturally suffers in braking zones and mid-corner speed. 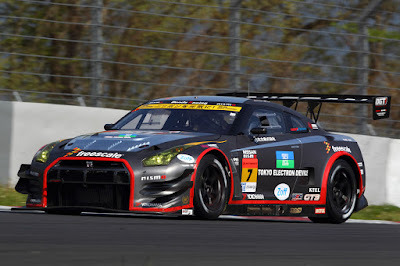 The top speed however, with some tailwind at Fuji Speedway, is 285km/h (180mph). 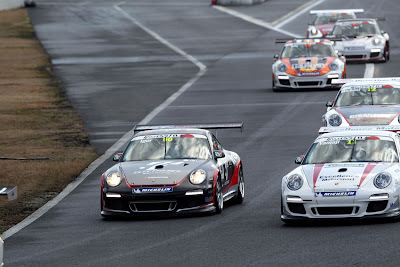 The official pre-season test at Fuji Speedway for Porsche Carrera Cup took place on March 15 and 16. The entire first day was spent on finding the right balance on the car, and so was the morning of the second day. 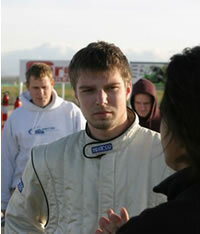 Here is onboard from day 1 - the car was rather uncooperative and it was very forced driving. This is 1:45.4 lap time. Unfortunately I can't go into much detail about the setup changes at this point since this is a spec-series - all competitors are racing in identical cars. For the last session on day 2, I felt pretty happy with the resulting setup and we threw on a new set of tires for a qualifying simulation. The result - top time out of all of the PCCJ drivers! Time: 1:44.1 shaving off 1.3 seconds from day 1 in a car that's become just a pleasure to drive.